James Ochoa returns to the podcast on this episode. James is a licensed professional counselor and the author of Focused Forward: Navigating the Storms of Adult ADHD. He is the founder and Director of the Life Empowerment Center in Austin, Texas. James offers action-focused counseling and executive coaching to help his clients discover ways to empower themselves in all areas of life. His passion is treating the emotional distress of ADHD so clients can build their internal worlds using their imagination to manage their attention challenges. In this conversation, you will hear James talk about emotional regulation. He discusses the concept of emotional distress syndrome and the stress model, which involves distress and eu stress. James shares how micro-meditations in the middle of the day create the activation of the kinesthetic muscle and how that activity helps keep us in balance. He shares how slowing down actions by 25% at any given moment puts the mind in a state of pause and contemplation. You will hear helpful strategies that are customizable and easy to implement. [04:02] – I share what has been going on in my life, which includes a recent move, working on becoming a minimalist, and trying to find an office space. 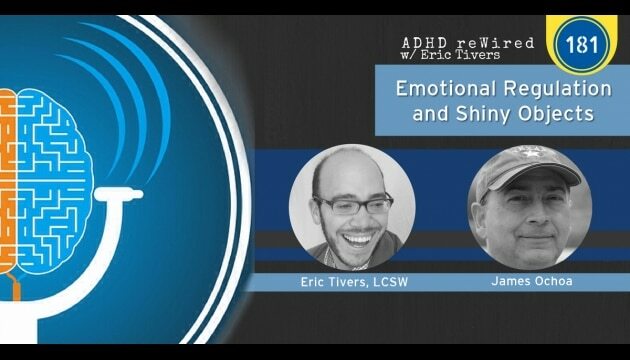 [17:00] – James shares that he has been diving into the emotional distress of ADHD. He explains that this is a balancing factor. [20:03] – James shares that he came up with the concept of emotional distress syndrome, a low-grade post traumatic stress. [21:07] – James would like people with ADHD to think about the stress model from a two component system, distress and eu stress. [23:13] – James talks about handling eu stress and moving forward. [25:41] – I share that I recently listened to a guided meditation with poor audio quality and I was able to shape this into a really good experience. [27:12] – James talks about elevating meditation to a higher level of need. [33:19] – James shares that as he walks on the beach, he will close his eyes. He explains that it helps keep him connected to himself. [35:00] – James talks about Emotional Distress Syndrome. He explains micro-traumas and why it is critical to understand them. [37:36] – James states that it is important to customize and personalize strategies that work. [42:24] – James explains the shiny object du jour. [47:51] – James would like to develop a professional consultation model, and he talks about this. [56:24] – James follows up on our conversation when he was on the ADHD reWired Hot Seat the last time he was on the podcast. [59:41] – James shares that exercise has been difficult for him and customized short-term goals have helped him.